But since she was put away, I couldn't play with her.. so I kept an eye out for another one on sale, and found Jeline (A Love me or Die Beryl) for sale from Lelahel. And since I had admired Jeline so much from afar, I am so happy to have her here! I think because Jeline has always been a clothes model, I have no problem hauling her around and dressing her up. 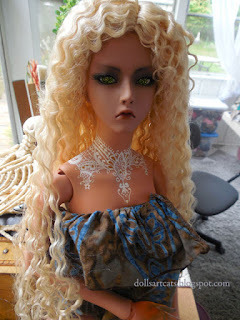 Also she has a custom faceup and not the original--I actually prefer this one, though it is less "collectible". (Sicktress did that amazing body paint). ....but being an abandoned order, she had no hooves or horns, and I have a lot of Beryls, including the Ultimate Beryl in the form of Sophie Cushion--which Cat bought from Lazulistar and then sent TO ME for a present! And Quinn, who is gorgeous but whose photo I have misplaced (maybe Cat will send me a link and her info again). So I thought to myself, "Well, I finally have a rational number of Beryls here." and then I went immediately onto Den of Angels and bought a Beryl head from Arekushia. Which will fit on the WS Soom body I have here. And then I will have Amaranth, who will eventually want WS hooves of her own. But she already has a nice faceup. And I am running out of long names that start with A. Thank *you*! Both Akutenshi and I were talking about how wonderful she became at your house! She really came to life!